Alfredo Russo: talent is also a recipe! More 1 star chefs here. Other Italian chefs here. Most of all, many years’ experience and the same wish to experiment and innovate as when, at 13, he was “initiated” into cuisine. Then, Alfredo Russo attended a hotel management school with passion. From there, he worked his way in various famous restaurants. Thus started Alfredo Russo’s adventure into the world that taught him high cuisine. 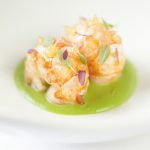 As a result, he learnt to revolutionise with his creations and dishes. Today, after a series of international experiences and attendance at various events, Alfredo Russo manages his own restaurant. Most noteworthy, he is the manager of a restaurant located in one of the most magnificent Royal Palaces, the Palace of Venaria. 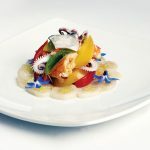 Indeed, Alfredo Russo, who was born in 1968 in Turin, found out his passion for cuisine as early as 13 years of age. 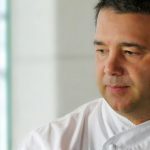 His career started at a hotel management school, followed by experiences in three Piedmontese Michelin guide starred restaurants. At the end of 1990 he started his adventure on his own with his wife Stefania at Dolce Stil Novo’s in Cirié (Turin). Eventually, he was awarded ‘his own’ star after three years only. Also, he qualified as the best young cook in 2004 according to the Espresso Guide. Over the last few years of professionalism, Alfredo Russo has won more and more acknowledgements. At a national and international level. So much that Italian and foreign food magazines have started to write about him. Also, over the last few years, besides taking care of the kitchen at Dolce Stil Novo’s, he has become a consultant. Indeed, he supports big hotel chain restaurants in Asia or cruise ships. Over the years he has taken care of various events. For example, important soirees such as the one given for the International Olympic Committee for Turin’s candidacy as the seat of the Winter Olympic Games in 2006. In addition, the one at the Unesco seat in Paris for the presentation of Turin and Rome as the capital of books. 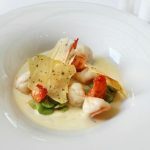 On top, together with top chef colleagues he managed the whole gastronomic offer of the hospitality area of the Piedmont Region during the Winter Olympic Games in Turin in 2006. Next to this, together with these colleagues in 2007, Alfredo Russo was also at the UN Glass Palace to introduce UN ambassadors and delegates to Piedmontese cooking and high cuisine. Moreover, between 2007 and 2008, Alfredo Russo has been a speaker. 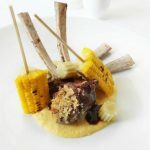 Such as at “Lo Mejor de la gastronomía” and “Madrid Fusion”, two among the world most important conventions devoted to high cuisine. There, he played a leading role in the TV program ‘Krav Sakkinim’ (Knives Battle) on the Israeli national Channel 10 . Simultaneously, Accolade published his first book ‘Da Idea’, while recently Gribaudo has published his volume devoted to the use of honey in sweet and salty recipes. More 1 stars chefs here. Other Italian chefs here. Go back home.